From Amsterdam, we took a train to Essen and picked up our car. I got to ride in a VW Jetta or whatever. Brian had the BMW car. I was stuck with the naked one for the entirety of the driving trip. 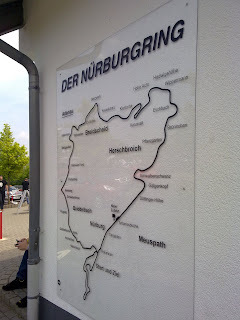 So, from Essen, we were supposed to drive to Nurburing, which is a race track that is apparently quite popular in the Grand Turismo games. Brian told us that we were going to get some food first. We didn’t. His aggressive driving caused us to lose track of his car. At this point, we didn’t know where our hotel/hostel is, so we had no way of meeting up with the rest of the people. All we knew was that Brian wanted to race his car. We got to Nurburing at approximately 1 pm. We waited a while to see if Brian shows up, but he never did. The naked one and I were definitely at the correct place. It was the place where we ordered our ticket to ‘race’ on the track. There was only one parkade, so we decided to just park and have a siesta (nap) while waiting for them. Three hours passed without interruption. The chance of meeting them now is incredibly low. If only we had a way to communicate with the other group. We were ready to leave to head to Berlin, which was our next stop after staying in Koln. By chance, we stopped and turned into a parking lot. Didn’t see anything, so we were about to head out. At the last possible second before we turned, a car honked. It was Brian. We met up and spent a little time on the tracks. When we got to Koln, we went for a mexican dinner. Om nom nom. Delicious. 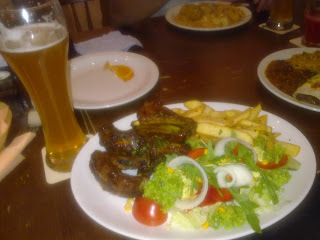 I had spare ribs.